It might be a bit unusual that the best NFL sportsbook for teasers – which is a slightly intermediate form of football betting – is also the best place to wager on parlays – which is generally considered a more novice form of play. But that’s what 5Dimes.com offers, in addition to its reputation for offering the biggest assortment of wager types. Teasers, for the uninitiated, are bets where you can move or ‘tease’ the line in your favour. If you have two games with big favourites (assume each is -10) and you buy a 6-point teaser, then the line is now -4 for each game. You pay extra for the privilege, but now your wager looks much safer. 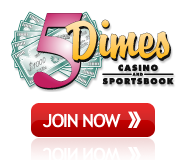 At 5dimes.com, the prices charged for teaser odds and the payouts when you win are the best in the business. They also offer a Reward Points program which makes this even more attractive. For parlays (and government lottery bettors in Delaware and sports lotteries in Canada will be aware of these), the same value applies. In a parlay, you put bets on two games together in a single bet and both need to win for the parlay to win. It sounds simple, but it’s not and some sportsbooks don’t offer the appropriate and fair payouts when you win. 5Dimes.com is known in the industry for its fair parlay odds (2.64 to 1 assuming normal -110 commission) and 6/1 for a three-game parlay. Wanna try a 7-game parlay? The payout is huge at 92/1! And while some sportsbooks impose limits on the types of bets you can include in a parlay, the best NFL sportsbook for parlays offers a huge variety, limited only by your imagination and creativity. Honorable Mention: Bovada isn’t far behind in how it treats parlays and teaser odds and payouts. Ready to Start Wagering? - Click Here to Join Now! 50% Instant Sign Up Bonus! Up to 50% in Player Rewards! Up to 235% in Total Bonuses! Get up to $900 Free-Play!